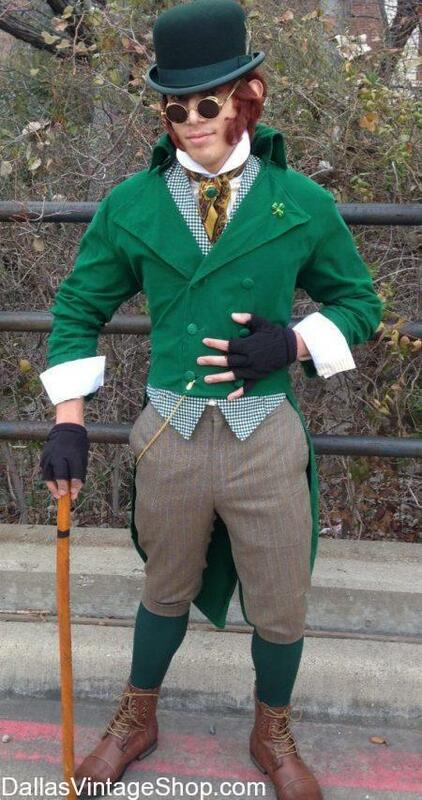 We have the largest collection of St. Patrick’s Day Men’s Costumes in the DFW area. Get this St. Patrick’s Day Aristocratic Leprechaun Outfit and enough clever and lucky Irish Characters Costumes that are perfect for St. Patrick’s Day Parade Wardrobes, St. Patrick’s Day Irish Festival Attire and Novelty Irish Festival Garb. Get Irish Red Headed or Green Hair Wigs, Shamrock Irish Beads, Green Top Hats and Bowler Hats, Novelty Irish Beards, Irish Barmaid Dresses, Irish Kilts and Historical St. Patrick’s Day Theatrical Quality Costumes and Accessories at Dallas Vintage Shop. You will also St. Patty’s Day Shamrock Printed Suits or just the Vests or Ties you need to promote your Irish Heritage and Pride. There is more St. Patrick’s Day Costume Options at Dallas Vintage Shop than you have ever seen in one place. Get entire St. Patrick’s Day Men’s Costumes or just the Accessories you need. You can choose from Superior Quality Celebrity Status Attire or Economical Irish Costumes or Accessories you need. From Irish Royalty to Barmaids and Irish Trailer Trash, we have the St. Patty’s Day Outfits and Ideas you want.